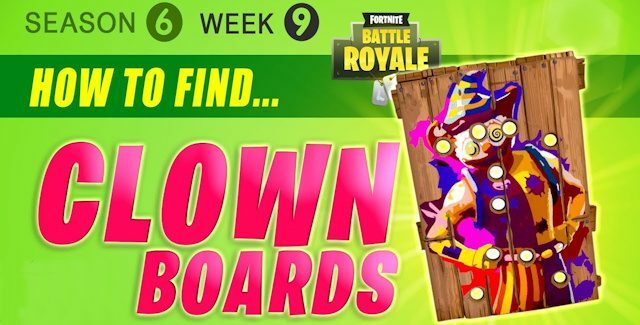 Welcome to the Fortnite Season 6 Week 9 Challenges: Battle Star Treasure Map & Carnival Clown Boards & Mushrooms Locations Guide. Here you will find out how to get to the Carnival Clown Boards & Mushrooms & Treasure Chests Locations in Fortnite Battle Royale on PS4, Xbox One, PC, Mac, Switch & Mobile. 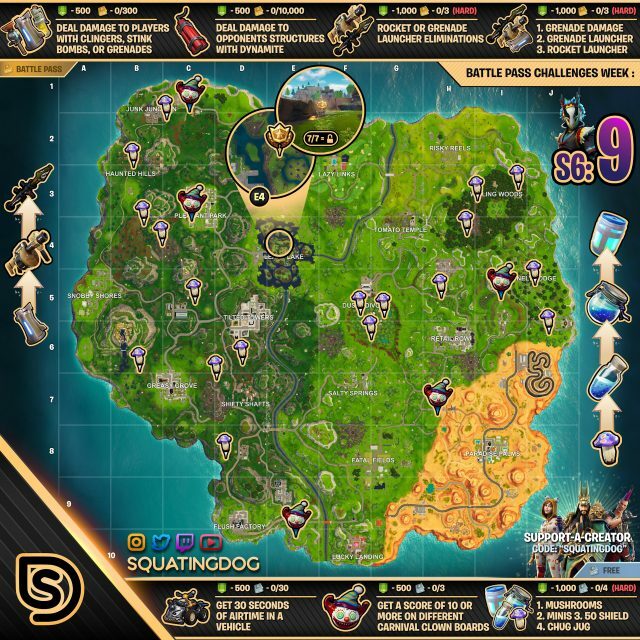 How To Find Search Challenge Locations In Fortnite Battle Royale – Season 6 Week 9: This video guide will show you Season 6 Week 9 of Fortnite’s Battlepass Challenges that includes finding all of the Chest as well as the Carnival Clown Board & Mushroom locations around the map. Note: Week 9 challenges will be available on November 22nd at 4am ET/8am GMT. This was an intended change to push back Weekly Challenges to Thursdays (half a year ago). That’s why they are not working until Thursday. Tip: Go to “Food Fight”, step in your favorite vehicle and drive to a corrupted area to get your vehicle launched into the air by jumping over a purple volcano for maximum airtime. Tips: The are a total of 5 Carnival Clown Boards, but you only need 3 different ones for the “get a score of 10 or more on different Carnival Clown Boards” challenge in season 6 week 9. This video guide goes over the locations of all 5 boards around the map, you only need 3 for the challenge. The game is pretty simple, walk up to the game board and activate it by pressing X on Xbox One / Square on PS4 / Y on Switch. Then just hit the balloons with your pickaxe before they pop. You need to get a score of 10 on 3 different Carnival Clown Boards to get the on-screen message for completion. Tips: Mushroom Consumables can be found near the corrupted area of Wailing Woods. The locations of the mushrooms can change each match but will always be in this general area. Consume 5 Mushrooms to complete this Week 9 Challenge. Tips: The Season 6 Week 9 secret Hunting Party Battlestar can be found on a barbeque at Leaky Lake. To actually get the star to appear though, you first need to complete THREE sets from any of the weekly challenges (weeks 9-90). Once 9 sets of them has been completed, this secret battle star can be collected. It will reward you with one full battle pass tier. Bonus Reward: Completing every challenge in 7 different weeks will unlock the secret hunting party skin. Time to complete Fortnite Battle Royale’s Battle Pass Challenges for Season 6 Week 9!